WHY GET A NSFAS LOAN? HERE IS ONE REASON. Towards the end of 2009, Gcobisa Sibango made newspaper headlines when she beat hundreds of applicants for a sought-after job as a law clerk in the Constitutional Court in Johannesburg. For any law student, this was considered a prestigious vocation and for Gcobisa, this was a great opportunity for herself and her family. Born in Libode in 1985 Gcobisa has four siblings, one a qualified doctor. She told reporters that from the age of 13 she had dreamed of wearing a black gown and being an attorney defending people, even though at that young age she didn’t really know what a lawyer was. All that mattered was that someday she wanted to become one. 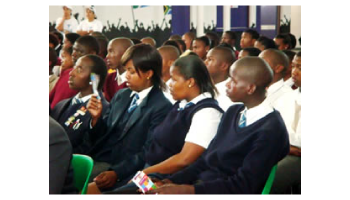 As a result, Gcobisa was determined to excel at school and at university. Her performance was thus above average and after she registered at Walter Sisulu University in 2005, she kept an impeccable academic record which kept her in good stead. Because of her academic potential to succeed and her financial need, she qualified for NSFAS funding to pay for her university studies as well as another partial bursary which helped her finance her way through her degree. In turn, Dr Makiwane expressed his admiration in Gcobisa’s determination and dedication to the field and praised her outstanding academic achievements. “Her performance has always been above average and the best part about her is her commitment. We are just so proud of her,” he said. Gcobisa was personally interviewed by Justice Albie Sachs for the position of law clerk in the Constitutional Court. Media explained that she had been questioned on her knowledge of the Constitution and the cases argued before the Constitutional Court. She gave an example of the case involving the Freedom Front Plus and the Independent Electoral Commission (IEC), which sought to compel the IEC to allow South Africans living abroad to vote. “They seemed impressed with my answers,” she said. According to Sachs, each of the 11 Constitutional Court judges is assigned two law clerks. Sachs said that in recruiting law clerks, the Constitutional Court gave a lot of consideration to the diversity of their candidates, and also tried to give opportunities to people who had been previously disadvantaged. Far from a childhood in rural Libode, the opportunity to work as a law clerk has indeed opened up many doors for Gcobisa. In 2011 she will venture on towards a career as a candidate attorney for the biggest corporate law firm in Sandton, Bowman Gilfillan.